At the beginning of the 1990s, Russian rocket engineers watching with horror the demise of the magnificent Energia-Buran program under the crumbling Soviet economy made a last-ditch attempt to save its unique technological heritage within the Energia-M rocket. While much smaller and cheaper than the original 2,400-ton Energia, the Energia-M would preserve all key components, launch infrastructure and experience of the USSR's largest space project... And, it would still be the most powerful space vehicle of its day! 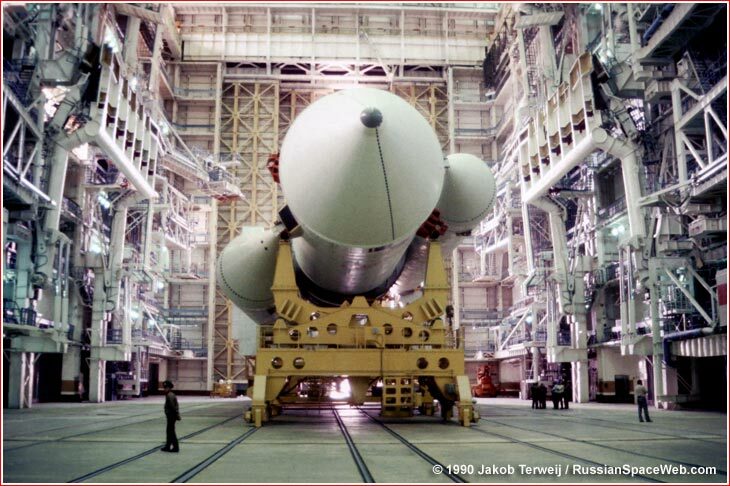 Above: A full-scale prototype of the Energia-M rocket is being prepared for its rollout to the launch pad in 1990. Above: Rollout of the Energia-M rocket to the launch pad in Baikonur. *Spacecraft would need its own propulsion system to enter an initial parking orbit. At the dawn of the Energia-Buran program, its creators at NPO Energia near Moscow studied a stepped approach toward the 100-ton-payload Energia rocket with "lighter" vehicles, which could carry from 30 to 60 tons of cargo. In 1976, engineers proposed the RLA-125/Groza ("thunder") vehicle, which would be comprised of the regular (core) stage of the Energia rocket, however it would be assisted at launch by only two boosters, instead of four on the original vehicle. In 1977, the project was further detailed, but remained on paper, as all resources had to be focused on the super-heavy Energia. Only at the end of 1984, the Soviet government gave the green light to a preliminary design of the Groza heavy launcher, which was completed next year, promising a payload of 63 tons to the low Earth orbit. 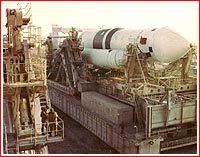 Yet again, the project remained on the drawing board until Buran's first launch in 1988. By that time, the space industry was already facing a shrinking space budget prompting its leaders to ask NPO Energia to study a scaled-down version of Groza for launching civilian and military satellite with a mass from 25 to 40 tons. In 1989, engineers achieved this goal by dropping two out of four RD-0120 engines on the core stage with a corresponding shortening of its body for a smaller propellant load. In addition, engineers looked at a possible design which would carry from 27 to 50 tons, including a version using a winged reusable first stage. By 1990, this work resulted in the new preliminary design of the Neitron (Neutron) rocket, later renamed Energia-M or 217GK. As clouds around the main Energia rocket were gathering, its smaller cousin increasingly looked as the only way out for the cash-strapped program. After the Russian Ministry of Defense essentially abandoned its support for the reusable Buran orbiter, the super-heavy Energia had little prospects of finding any alternative passengers with a mass of 100 tons. At the same time, the smaller, cheaper Energia-M could be employed to carry clusters of big commercial satellites, or so its creators thought. Not to waste any time, NPO Energia quickly formed a team led by its veteran engineer Vechaslav Filin to turn the project into metal. 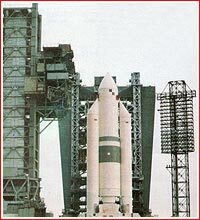 By the end of 1990, a full-scale prototype of the Energia-M was manufactured and then rolled out to the launch pad at Site 250 in Baikonur at a price tag of seven million rubles. At the time, a few foreign journalists were allowed to access the Baikonur Cosmodrome for the first time. A veteran observer of the Soviet space program Jakob Terweij took unique photos of the Energia-M rocket during its short-lived stay on the launch pad. Only recently digitized, these photos are now preserved for history on this page along with other visuals related to this historic event. 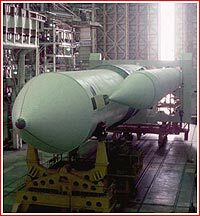 In the first half of 1991, in the midst of Gorbachev's perestroika (a Russian term for "reforms"), the Soviet government tried the novel idea of a tender for the next-generation launch vehicle. NPO Energia submitted the Energia-M design, competing with bids from teams at KB Yuzhnoe in Dnepropetrovsk, who put forward a multi-booster version of its Zenit rocket known as 11K37; and with KB Salyut, which offered a radical upgrade of its Proton rocket. On July 6, Energia-M was declared the winner. Immediately, NPO Energia began work on specifications and technical assignments for the Energia-M's components. 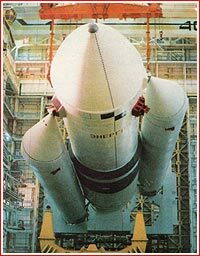 The USSR suddenly dissolved in just few months in the second half of 1991, however NPO Energia has continued the work on the design documentation and the preparation of the manufacturing base for the Energia-M rocket until as late as 1993. In the same year, the director general of the newly created Russian space agency, RKA, Yuri Koptev signed off on the formal technical assignment for the development of the Energia-M rocket. 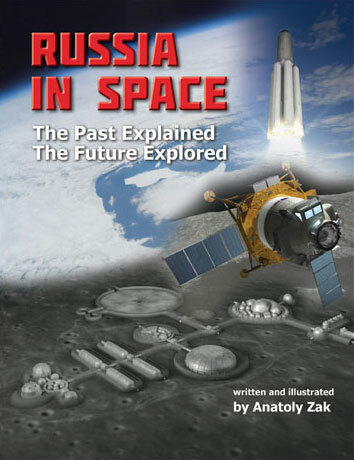 The document was also approved by the commander of the Russian Military space forces Vladimir Ivanov. Money provided, Energia-M could make its first liftoff as early as 1995. The 1,050-ton Energia-M rocket could deliver up to 34 tons to low Earth orbit, thus exceeding the payload mass of the US Space Shuttle by as much as 10 tons. The rocket relied on propulsion systems from both stages of the original Energia, but used two RD-170 engines instead of four on the first stage and only one RD-0120 engine on the second stage instead of four on the Energia. Using RD-0120, the Energia-M would allow the post-Soviet Russia to retain all necessary technology and infrastructure for the most powerful hydrogen rocket engine ever built in the USSR. 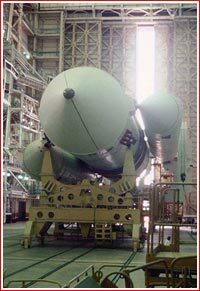 The rocket would also require much of the existing Energia-Buran launch infrastructure in Baikonur. 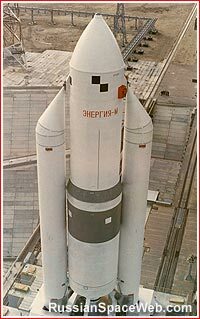 Its creators hoped that Energia-M would eventually replace the smaller Proton rocket, which relied on toxic propellant. For that purpose, NPO Energia's engineers drafted at least three different space tugs for Energia-M, which would act as a third stage boosting satellites from an initial parking orbit to a geostationary orbit. The largest of these stages would use hydrogen fuel. Along with the largest communications satellites, the two-stage version of Energia-M could carry space station modules to low Earth's orbit. 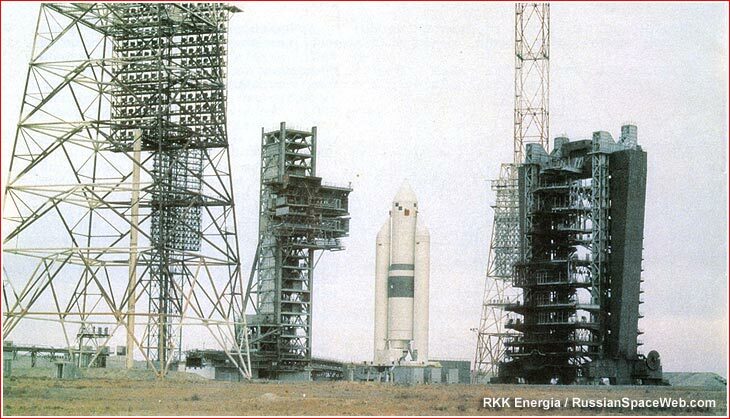 However, Energia-M's awesome capabilities and reliance on existing infrastructure in Baikonur turned into its weaknesses after the collapse of the USSR. Despite its scaled-down design, the vehicle was still oversized for most existing Russian payloads, prompting NPO Energia to look for other, sometimes really exotic jobs for Energia-M, such as hauling radioactive waste into burial orbits! NPO Energia's proposals for an oversized communications platform, which would require Energia-M, also went unfunded. Moreover, Baikonur, where Energia-M was to be based, ended up in the newly independent Kazakhstan and the Russian Ministry of Defense saw a serious threat to its presence at the site, thus choosing to bank on Plesetsk (safely located inside Russia) as a launch site for any future space vehicles. Energia-M's design and propellant combination also required involvement of contractors in the former Soviet republics of Ukraine and Uzbekistan. Last but not least, the economic crisis in Russia forced the Kremlin to largely abandon the expensive hydrogen infrastructure of the Energia-Buran project. With it, the Energia-M was doomed as well. 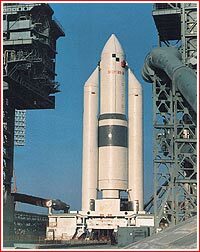 In 1992, the Russian government set the course toward the new-generation launch vehicle to be built and launched inside Russia, while the Energia-M project was finally abandoned in 1995. The full-scale mockup of the Energia-M was stored inside Dynamic Tests Building, SDI, (a.k.a Obyekt 858) at Site 112A, where it remained for decades.